Brakes did well to fight back twice against a visiting side clearly in confident mood following two good wins on the road and Hereford continued to threaten despite being reduced to ten men with half an hour to play. James Waite catches Joe Clarke with his elbow. Paul Holleran reverted to the same XI that had kicked off the last league game against Altrincham, with Connor Gudger returning to the squad having made his comeback in the Birmingham Senior Cup on Tuesday evening. Connor Taylor was not risked after his injury in the same game, while James Bowen was unavailable. The only incident of any note in the opening ten minutes was Kieran Thomas’ crude lunge on Jamie Hood which earned the Hereford defender a booking. Ahmed Obeng saw a shot drift across goal and wide for Leamington, while Tom Owen-Evans sent an effort well wide at the other end. With the half-hour mark approaching it was the visitors who were beginning to gain the upper hand. Eliot Richards stole in behind the Brakes defence to go in on goal inside the penalty area, but Tony Breeden denied him with a strong right hand to parry his shot away. The captain was alert once more as he pushed a low, curling effort from James Waite behind for a corner but the diminutive front man found the net shortly afterwards, sending the ball bouncing past Breeden after Obeng had blocked the initial shot. It was a frustrating way for Leamington to concede and they took several minutes to regain their composure. When they did, Jack Edwards hauled them level a minute before half-time with a stunning right-footed effort arced powerfully into the top corner. Having barely finished celebrating, Leamington then shot themselves in the foot by giving away a penalty, Owen-Evans taking advantage of James Mace’s hands on his back by going to ground very easily. Despite Waite's pleas, referee Scott Simpson dishes out a red card. 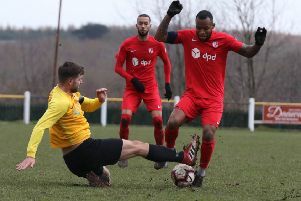 He then picked himself up to beat the dive of Breeden with his spot-kick to leave Brakes frustrated as they headed for the dressing room at half-time. Out early for the second half, Leamington were straight on the offensive, Josh Gowling heading away from the goal line as Callum Gittings headed a free-kick back across goal. Meanwhile, Waite fired just wide following some neat build-up play from Hereford. Obeng curled another effort off target, while Bulls keeper Matt Yates, who had dealt with everything thrown into his penalty area in the first half, failed to claim a high ball but Colby Bishop and Jordan Murphy were unable to force it home. The visitors were forced to complete the game a man light, with Waite was immediately shown a red card by referee Scott Simpson after he caught Joe Clarke in the face with a flailing arm as the two players competed for a header. Colby Bishop and Jordan Murphy try to force the ball home after keeper Matt Yates fails to gather. It was open to interpretation but it was clear from the speed the card was shown that the referee was in no doubt. It was the cue for Leamington to really turn the screw as they searched for the equaliser. Bishop was denied by a fine block challenge from Jimmy Oates as he pulled the trigger, before Edwards bludgeoned his way past several defenders into the box only to see his effort charged down. Richards almost grabbed what would have surely been a game-clinching third for Hereford in bizarre fashion as he chased a diagonal pass up to the right edge of the penalty area, beating Breeden and Jack Lane to the ball and clipping it towards goal, where it appeared to strike the outside of the post. Brakes were then gifted a corner by their visitors which Junior English met at the far post, driving the ball agonisingly back across the goalmouth. Gittings picked up possession on the far side and turned back inside before seeing his shot blocked. The break Leamington were searching for finally arrived with six minutes to play. Murphy was upended just inside the box by Gowling and Bishop stepped up to crash his 19th goal of the season past Yates. There were some hairy moments for the visitors as Brakes searched for a winner, two crosses flashing across goal and Bishop and Murphy almost reaching a free-kick into the box from Breeden ahead of Yates but both sides had to settle for a point from an entertaining 90 minutes. Brakes: Tony Breeden, Junior English, Jack Lane, Joe Clarke (Reece Flanagan, 78), Jamie Hood, James Mace, Jordan Murphy, Callum Gittings, Colby Bishop, Jack Edwards, Ahmed Obeng (Mikey Taylor, 74). Subs not used: Connor Gudger, Sam Wilding, Tom James. Hereford: Matt Yates, Kieran Thomas, Danny Greenslade, Jordan Cullinane-Liburd, Jimmy Oates, Josh Gowling, Tommy O’Sullivan, Tom Owen-Evans, Eliot Richards (Kyle Finn, 89), James Waite, George Lloyd (Mike Symons, 67).Subs not used: Harvey Smith, Theo Wharton, James Roberts.